March is the third month of the year in the Gregorian calendar, coming between February and April. It has 31 days. March is named after Mars, the Roman god of war. March always starts on the same day of the week as November, and additionally, February in common years. March always ends on the same day of the week as June. The daffodil is a symbol of the month of March, when spring begins in the Northern Hemisphere. In ancient Rome, March was called Martius. It was named after the war god (Mars) and the Romans thought that it was a lucky time to begin a war. Before Julius Caesar's calendar reform, March was the first month of the year in the Roman calendar, as the winter was considered to be a monthless period. March is one of seven months to have 31 days. March starts on the same day of the week as November in all years, and also starts on the same day of the week as February in common years. In a common year, March starts on the same day of the week as June of the previous year, and in leap years starts on the same day of the week as September and December of the previous year. Every year, March ends on the same day of the week as June, and ends on the same day as December of the previous year if it is a leap year. In leap years, the day before March 1 is February 29. This determines the position of each day of the year from there on. As an example, March 1 is usually the 60th day of the year, but in a leap year is the 61st day. In terms of seasons, March is a month that has an equinox, with daylight and darkness of roughly the same number of hours, halfway between the December and June solstices. In the Northern Hemisphere, spring starts in this month, while it is autumn in the Southern Hemisphere. The official start of either season is March 1, though the equinox can fall on March 20 or 21, occasionally on March 19. The northern spring equinox marks the start of the Iranian New Year and Baha'i New Year. It is from the March 21 date that Easter's date is calculated, on the Sunday after the first full moon in spring, meaning it can fall between March 22 and April 25 in Western Christianity. 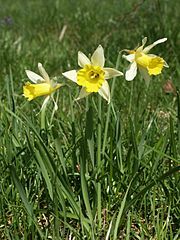 March's flower is the daffodil and its birthstones are the bloodstone and aquamarine. The meaning of the bloodstone is courage. The star signs for March are Pisces (February 20 to March 20) and Aries (March 21 to April 20). Saint David's Day celebration in Cardiff Bay, Wales on March 1. 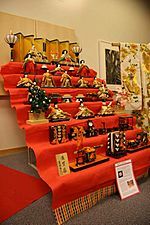 Seven-tiered doll set celebrating Hinamatsuri, Girls' Day, in Japan on March 3. 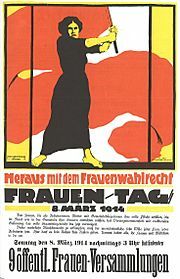 German poster from 1914 marking International Women's Day on March 8. 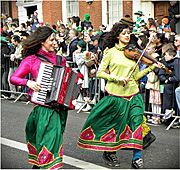 Saint Patrick's Day celebration in Dublin on March 17. 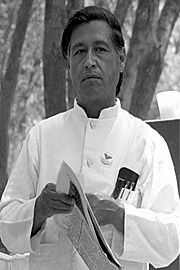 Cesar Chavez, whose birthday is observed in the US on March 31. Eggs celebrating Easter, which sometimes falls in late March. On a Sunday between March 1 and April 4, Mother's Day is celebrated in the UK. Lent and Easter-related observances in Western Christianity. Easter occurs on a Sunday between March 22 and April 25 (note: In Eastern Christianity, Easter falls between April 4 and May 8). Jewish Passover coincides with Christian Holy Week, earliest run is March 15 to March 22, latest run is April 18 to April 25. Canada and the United States start Daylight Saving Time on the second Sunday in March. Clocks go forward one hour. European Summer Time begins on the last Sunday in March. Clocks go forward one hour. The Winter Paralympics are often held in this month. Work on Mount Rushmore begins on March 3, 1925. Devastation caused by the earthquake and tsunami in Japan on March 11, 2011. Canberra is officially named on March 12, 1913. Maine became the 23rd US State on March 15, 1820. Sydney Harbour Bridge, which was opened on March 19, 1932. Painting showing the US's agreement on March 30, 1867 to buy Alaska from Russia. March 1, 1872 - Yellowstone National Park becomes the world's first national park. March 1, 1910 - An avalanche buries a train in northeastern King County, Washington. March 1, 1919 - The March 1st Movement begins in Korea. March 1, 1936 - The Hoover Dam is completed. March 2, 1956 - Morocco declares its independence from France. March 3, 1845 - Florida becomes the 27th State of the US. March 3, 1925 - The Mount Rushmore monument is founded, starting work on carving four Presidents' faces into the mountain. March 5, 1953 - Russian composer Sergei Prokofiev and Soviet leader Joseph Stalin die on the same day as each other. March 6, 1788 - The first fleet of convicts arrives at Norfolk Island. March 6, 1957 - Ghana becomes independent from the United Kingdom. March 7, 1867 - Alexander Graham Bell is granted a patent for the telephone. March 7, 1912 - Roald Amundsen announces that his Norwegian expedition successfully reached the South Pole on December 14 of the previous year. March 8, 1911 - First celebration of International Women's Day. March 8, 1918 - The first cases of the deadly Spanish flu virus are reported. March 9, 1908 - A five-man team climbs to the top of Mount Erebus in Antarctica. March 9, 1959 - The first Barbie dolls are sold. March 10, 1906 - A deadly mining disaster in Courrieres, France, kills 1,099 miners. March 10, 1977 - Astronomers discover rings around the planet Uranus. March 11, 1985 - Mikhail Gorbachev becomes leader of the Soviet Union. March 11, 1990 - Lithuania declares its independence from the Soviet Union. March 11, 2004 - Terrorists bomb rush-hour trains in Madrid, killing 191 people. March 11, 2011 - The 2011 Sendai earthquake and tsunami disaster kills many thousands of people in northeastern Japan, after a magnitude 9.1 earthquake, tsunamis, and a nuclear disaster at Fukushima. March 12, 1913 - Canberra is officially named. March 12, 1930 - Mahatma Gandhi begins his Salt March, as part of the movement for Indian independence. March 12, 1968 - Mauritius becomes independent. March 13, 1781 - William Herschel discovers the planet Uranus. March 13, 1881 - Tsar Alexander II of Russia is murdered when a bomb is thrown at his carriage. March 13, 2013 - Pope Francis is chosen as Pope. Coming from Argentina, he is the first Latin American Pope. March 14, 1879 - Albert Einstein is born. March 14, 1883 - Karl Marx dies at the age of 64 years. March 15, 44 BC - Julius Caesar is murdered on the Ides of March. 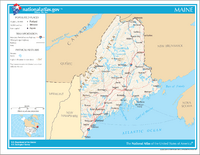 March 15, 1820 - At the easternmost tip of the US, Maine becomes the 23rd State. March 15, 1848 - Revolution in Pest, Hungary. March 17, 1861 - Italy becomes a Kingdom, making Italy a unified state. March 17, 1959 - Tenzin Gyatso, 14th Dalai Lama flees to India. March 17, 1992 - A referendum in South Africa supports the end of Apartheid. March 18, 1965 - Aleksei Leonov performs the first spacewalk. March 19, 1932 - Sydney Harbour Bridge is opened. March 20, 526 - An earthquake kills around 300,000 people in Syria and southeastern Turkey. March 20, 1861 - Mendoza, Argentina is destroyed by an earthquake that kills 6,000 people. March 20, 1956 - Tunisia becomes independent. March 21, 1844 - Start of the Baha'i calendar. March 21, 1960 - Sharpeville massacre: Police open fire on demonstrators in South Africa, killing 69 people. March 21, 1990 - Namibia becomes independent. March 21, 2006 - Twitter is founded. March 22, 1818 - Most recent occurrence of Easter on its earliest possible date. March 22, 1957 - The Arab League is founded. March 22, 1997 - Comet Hale-Bopp makes its closest approach to Earth. March 23, 1956 - Pakistan becomes an Islamic Republic. March 24, 1603 - Queen Elizabeth I of England dies aged 69, without children. James VI of Scotland becomes James I of England. March 24, 1989 - The Exxon Valdez oil tanker runs aground at Prince William Sound in Alaska, causing a devastating oil spill. March 25, 1821 - Greece declares its independence from the Ottoman Empire. March 25, 1957 - The European Economic Community is founded. March 26, 1830 - The Book of Mormon is published in Palmyra, New York. March 26, 1971 - Bangladesh's war of Independence starts. March 27, 1964 - The Good Friday earthquake strikes south-central Alaska. March 28, 1939 - Spanish Civil War: Francisco Franco conquers Madrid. March 29, 1792 - King Gustav III of Sweden dies as a result of being shot at a masquerade ball. March 30, 1867 - United States Secretary of State agrees to purchase Alaska from Russia for $7.2 million. March 30, 1981 - John Hinckley shoots at Ronald Reagan in an attempt to kill him. March 31, 1889 - The Eiffel Tower is opened to the public. March 31, 1968 - US President Lyndon B. Johnson announces that he intends not to run for re-election. 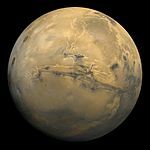 The planet Mars, also named after the Roman god of war. March is one of two months of the year that begin with an 'M' in the English language (May is the other). Both have an 'A' as their second letter, and they come on either side of April. It is less common for Easter to occur in March than in April. Recent occurrences in March were in 2002 (March 31), 2005 (March 27), 2008 (March 23) and 2013 (March 31). March is named for Mars, the Roman god of war, and is called "mars" in some languages. This is also where the planet Mars gets its name from. A march is also a type of music, originally written for and performed by marching bands. March also refers to a certain way of walking. March is also the name of a place in Germany. There is an animal known as the March hare. March Facts for Kids. Kiddle Encyclopedia.